freezing broccoli. an often overlooked way to preserve. 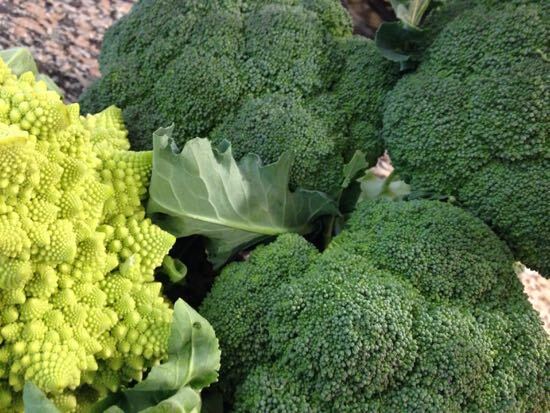 In the mid-Atlantic, it’s been an amazing year for broccoli and cauliflower and brussels sprouts – all the members of the cruciferous vegetable family. I was at a farmers market last weekend and I saw beautiful golden, purple, green and white cauliflower. I wish the photo I took had turned out. One of my favorite farmers recently offered a deal on organic broccoli. We eat a lot of broccoli all winter in stir fries and especially in vegetable pie, one of those easy to the table recipes that satisfies every comfort food need. It’s cheesy, it’s crispy, and there are potatoes. 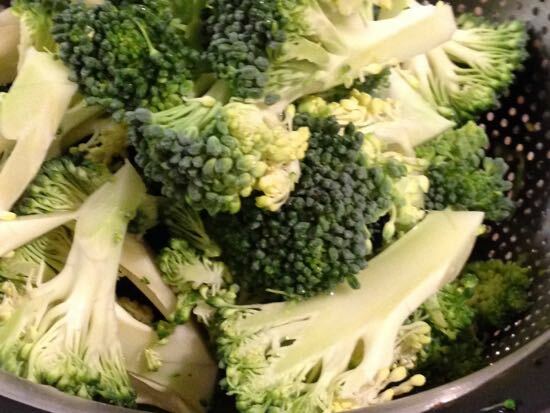 With the abundance of beautiful broccoli, I got to work blanching and bagging up this healthy vegetable so that comfort food could be delivered even faster. Here’s how easy it is. Get a huge pot of salted water boiling. Prep a giant bowl of ice water. Drop in the florets and cook until the water returns to a boil, then fish out the florets with a slotted spoon or a spider. Work fast and immediately place them in the ice water. 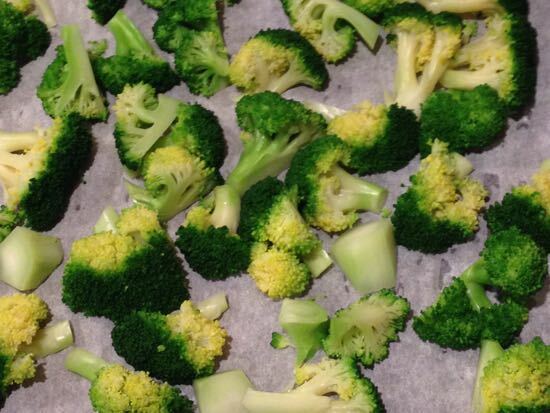 When the broccoli is fully chilled, in about five minutes, remove them to a paper towel lined baking sheet to drain. Once dry, place on another baking sheet, leaving some room between the pieces, and pop the whole thing in the freezer. You want them to quick freeze as individual pieces. After about an hour, they should be frozen solid. Place in a zip lock bag. 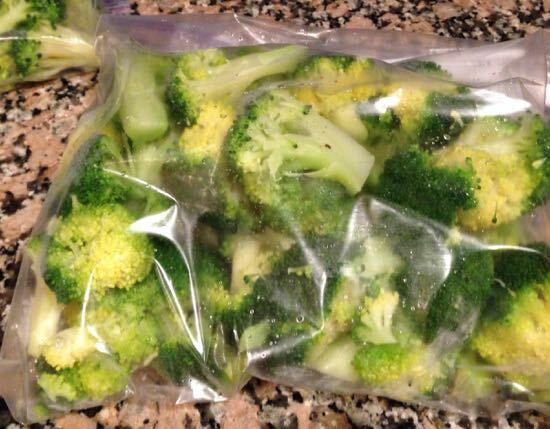 I freeze on entire head of broccoli in each bag. By freezing in this way, you’ll be able to fish pieces out of the bag one by one instead of in a huge icy block. Grate the potatoes and onion in the food processor or on the largest side of a box grater. Place in a colander and drain for a few minutes. Beat the eggs, salt and pepper in a large bowl and add the potatoes and onions, then mix (with your hands) until everything is well incorporated. Brush the bottom and sides of a deep dish pie pan with olive oil. Press in the potato mixture forming thick sides and a well into which the vegetables will go. Brush the top with olive oil. Roast in the oven for 35 minutes while you prepare the filling. As the potato crust roasts, heat a glug of olive oil in a sauté pan, add the diced onion, the oregano and a generous pinch of salt and grinding of pepper. Slowly cook and the onions until deeply brown and caramelized, about 20 minutes. Stir the broccoli into the onions and cook for five minutes or so, just until barely cooked through. Beat together the eggs and milk. In a medium bowl, mix the cheeses and parsley. Assemble the pie. Remove the crust from the oven. Sprinkle 1/3 of the cheese mixture on the bottom of the crust. Pile half the broccoli mixture into the crust. Scatter 1/2 the remaining cheese across the cauliflower mixture. Add the remaining broccoli, then SLOWLY pour the egg mixture over everything, letting it sneak into all the corners and spaces. Top with the remaining cheese. Reduce the oven temperature to 375°F. Bake in the oven for 35 minutes. 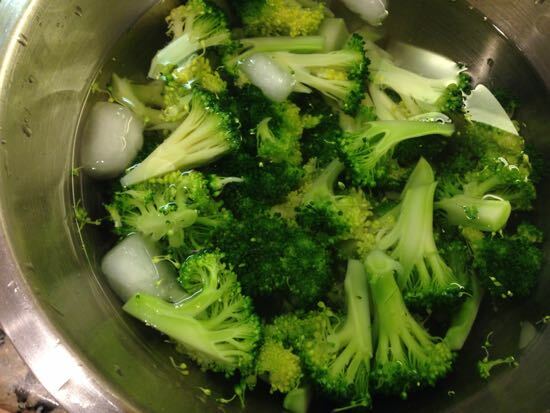 Allow it to rest for a few minutes before serving with a bright, acidic salad. Great tutorial Cathy – I think so many people forget about freezing as a very do-able preserving method! Catching up on your posts and this one is so timely. I was “gifted” excess broccoli from our CSA this week. I spent last night trimming, sorting so now it is ready for blanching….and for trying that wonderful pie recipe in a few weeks.